The laburnum stools we are coppicing. 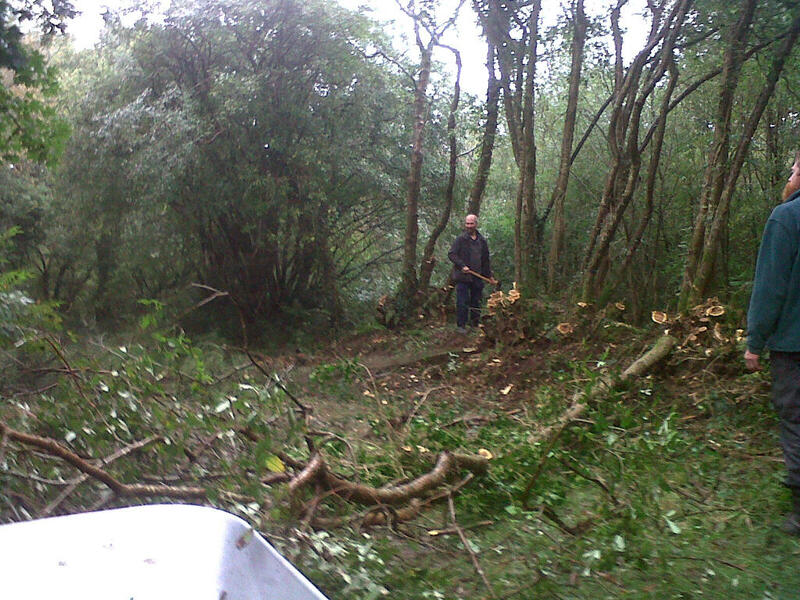 A volunteer using the felling axe. 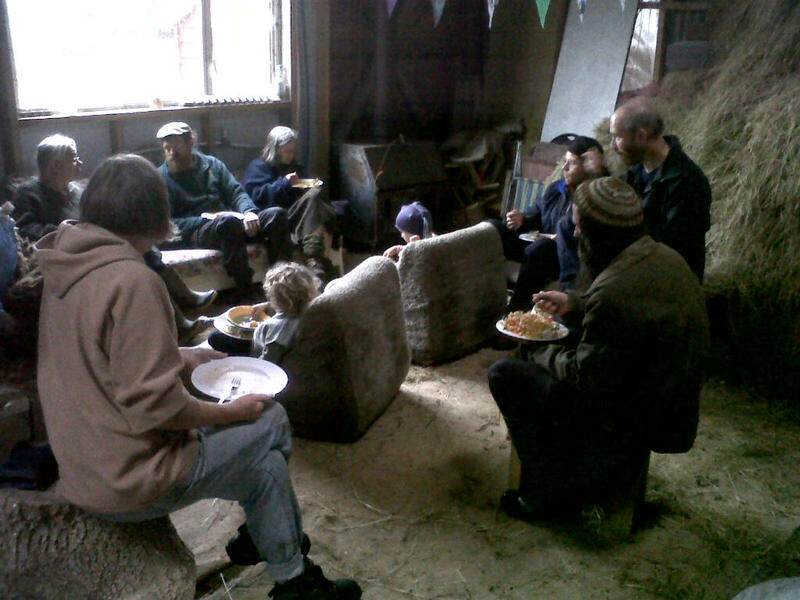 Eight of us gathered on Sunday 13th October for our Volunteer Workday. 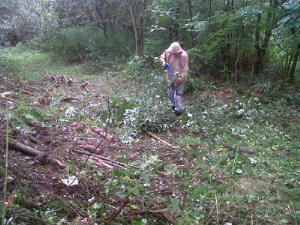 The main task of the day was to begin coppicing some Laburnums. All of the work was achieved using hand tools, many of which we have just purchased with a grant from Environment Wales. Nick and Barbara of Coppice Wood Collage showed volunteers how to fell using our new American felling axe and a couple of people had fun trying out this new skill. The Two-Man Cross Cut Saw also got it’s first outing, as did an amazing pole saw which did sterling work clearing branches that were overhanging an access track. The Trust land has many Laburnums in it’s hedgerow, as is typical of this corner of Dyfed. In late June / early July they give a glorious display, being covered with long racemes of yellow flowers. The trees are multi-stemmed, presumably as a result of coppicing in the past. As these trunks become very large, the trees can become increasingly unstable. 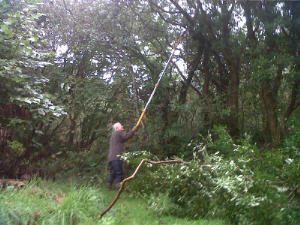 In the last two summers, we have had incidences of trunks in full leaf being blown out of the hedgerow. As the trunks lean out from, and sometimes fall out of the hedgerow the base of the tree starts to crack, letting water and rot enter. The trees start to look less healthy, with leaves yellowing and falling early in the season. We have started a rolling plan to coppice a stretch of Laburnums every year. The aim is to rejuvenate them and ensure their healthy survival into the future. The trees respond extremely well, showing vigorous growth in the following seasons and returning to flower within a few years. Longer lengths can be used in building. It makes excellent firewood if dried for two to three years, being dense and giving a hot, long lasting burn. The wood is very beautiful, with a deep red / brown heartwood contrasting with a yellow sap wood, and is popular with wood turners. As many parts of the tree are poisonous, perhaps it is better to reserves its use for items that will not be used with food! We will be continuing the work on the Laburnum on our next workday on Sunday 10th November, as well as starting work on some Willow and Hazel coppice. All are welcome to join us! For more details and directions, please contact us. This entry was posted in Permaculture, Volunteer Workdays and tagged coppice, laburnum, use of laburnum, volunteer, Wales, workday. Bookmark the permalink.